1. 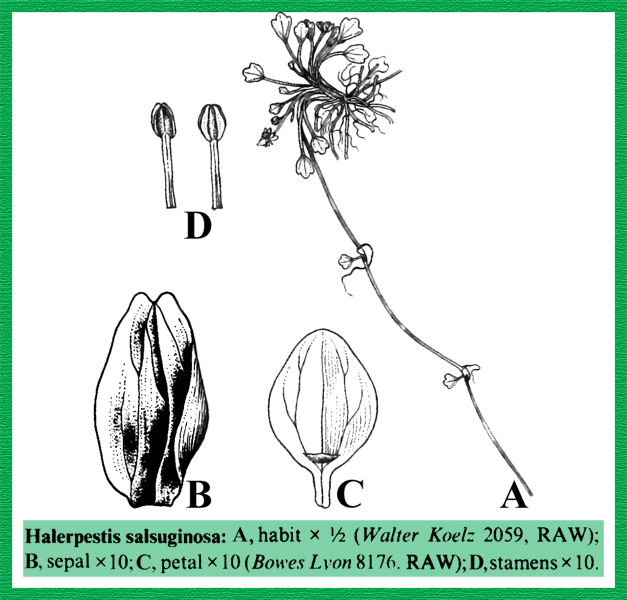 Halerpestes salsuginosa (Pall.) Green in Pittonia. 4:207. 1900. Ovezinni kov in Komarov, Fl. URSS. 7:330. 1937 (Fig. 23, D-G). Perennial, stems creeping with long, filiform stolons rooting at the nodes. basal leaves and leaves of stolons similar, much shorter than petioles, blade oblong-ovate to rounded ovate or rounded-reniform, base obtuse, the central one usually larger than the others, 6-15 mm long and wide. Sepals 5, 3-5 x 2.5-4 mm wide, ovate, glabrous. Petals about as long as sepals, 2-2.5 mm wide, oblong-ovate, shortly clawed. Carpels forming an oblong head. Style (beak) short, 1.3-1.6 mm long, acute, slightly recurved. Type: Described from Siberia (LE). Gilgit: A-7 near Naltar lake, Todd Nachowitz 184 (RAW), Baltistan: B-8 Shigar, M.A. Siddiqi & Y. Nasir 2365 (RAW), Skardu-Shigar, R.R. Stewart 20477 (RAW), B-9 Kiris, 8000', R.R. Stewart 20876 (RAW), Skardu, R.R. Stewart 20408 (RAW), id., M.A. Siddiqi & Y. Nasir 4102 (RAW). Distribution: A common, widespread and variable species in many parts of Siberia, Afghanistan, Pakistan, N. India, Himalaya, Mongolia, China and Japan. Found in usually wet places, above 2500 m.